Stepping out in this heat during the day involves carrying a truckload of stuff with you. Sunscreen? Check. Water? Check. Sunglasses? Grab a funky pair from one of these online stores and face that scorching sun in style. If you’re a fan of the elegant 40s or the rebellious 70s or the whacky 90s, Go Spiff. Started by Mansi and Pritish, Go Spiff keeps it old-school with their John Lennon/Depp inspired sunnies sourced from across the country. Pick up a vintage pair for yourself from their Facebook page. Where: Check out their Facebook page here. For updates, follow their Instagram account here. We love our mahoganies and teaks when it comes to doing up our homes but wooden sunglasses? They’re legit. Designer Sayon Chatterjee makes fine hand-crafted wooden sunglasses in a variety of shapes and shades for all our different face structures. Although this accessory store is targeted to teens, it has some great finds, even for the grown-ups out there. They have a pretty wide variety of sunglasses in all shapes, sizes and colours. From regular wayfarers and cat-eyes, they even have some quirky sunnies with things like moustaches hanging off them. This quirk-filled website does not disappoint with its eyewear collection. From Lennon-inspired reflectors to heart-shaped lenses, to colourful angular hexagons, the feel here is young, kitschy and fun. For more details, follow their Facebook page here. 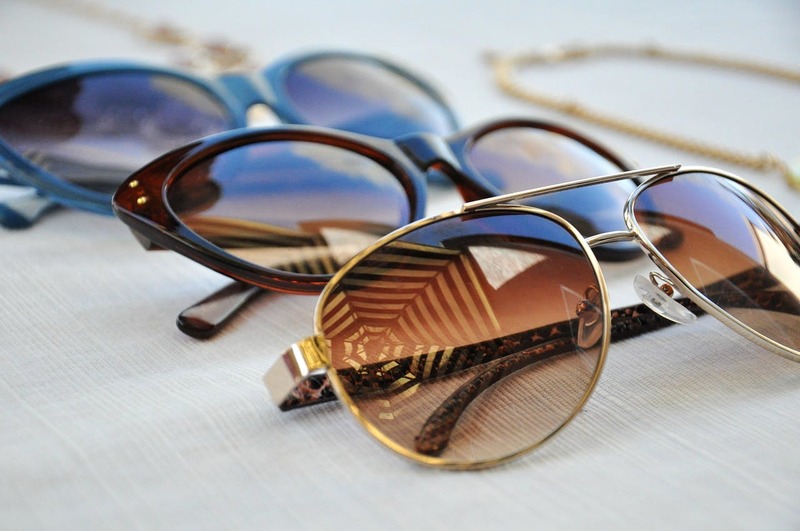 Find the latest, most chic sunglasses at the cheapest prices on Fashionara. Although they have everything from round to square to aviators and wayfarers, Fashionara’s isn’t too high on colour—but if you’re looking for that one simple, classy pair which will go with everything that you own without burning holes in you pocket, it’s your to-go place. For updates, follow their Facebook page here. Basic wayfarers, round shades and some super quirky flower-shaped and heart-shaped ones, Dulce Couture is turning our sunglasses into fun glasses. And they’re mostly priced under INR 1,000. Yay. They had us at their Sneak-a-Peak reflectors but we’re loving pretty much the whole collection. From aviators and wayfarers in neutral hues to bright shiny floral reflectors, they’re taking our outfits to a whole new level. Woodgeek started with plywood, but has progressed to rosewood and bamboo to make their sunglasses more durable. Whereas we’re loving their existing designs, you can also get them to customise.